Live Bet on Poker - a unique Live Casino game. 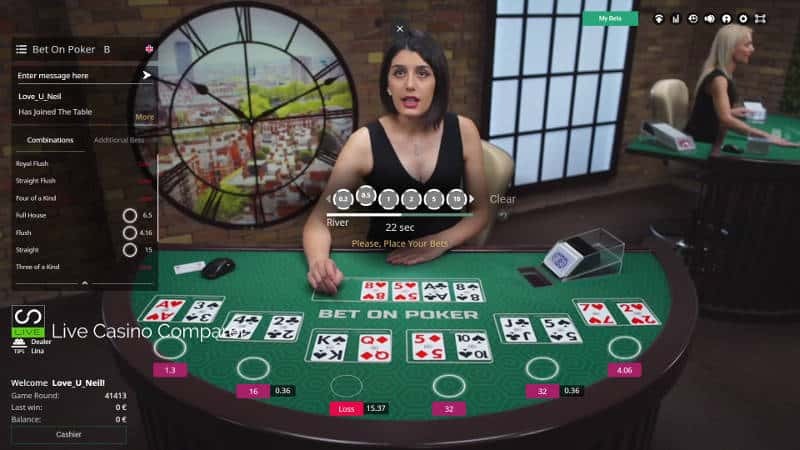 Live Bet On Poker is yet another derivation of the popular Texas Holdem card game, but this is different because it’s been adapted so that it can be played and streamed from live casinos. It is a different game from the popular Live Casino Holdem which doesn’t have in play betting. The difference with Live Bet On Poker is you’re playing against the “house”, not other players at the table. Importantly, you have multiple opportunities to bet on which hand you think will win after each card is dealt. Normal Texas Holdem rules apply. The aim is to make up the best 5 card poker hand from the player’s initial 2 cards and the 5 community cards dealt by the dealer. The dealer will deal 2 cards to each of the 6 playing positions, followed by the Flop, Turn and then the River. In between each deal is a betting round where you’re able to bet on which hand you think will win or additionally what you think the value of the winning hand will be. The odds for each of these change in real time as the cards are dealt. Bet before any cards are dealt. Bet after the players two cards has been dealt. Bet after the flop has been dealt. Bet after the Turn has been dealt. You can bet on the player position and the value of the winning hand at each betting round. Your bets for each round are locked in, so your bets in subsequent rounds do not affect your previous bets. This game really suits experienced Texas Holdem players who understand odds and hand probabilities. I’d recommend Live Casino Hold’em or Ultimate Texas Hold’em as very playable alternatives. Live Bet on Poker is played with one deck of 52 playing cards that are shuffled by a dealer. Once shuffled, the cards are placed into a dealing shoe. An unlimited number of players can play and bet on this game. The bets from each betting round are ring-fenced, which means that past bets have no impact on the ability to make future bets. The player can choose to bet or not to bet on each betting round. Place a bet on one or more player positions. Place a bet on what you think the value of the winning hand will be. These bets are more about guessing which player position or what hand value will win. At this stage, no cards are on the table so this bet will be a complete guess! The dealer deals two cards to each player position. At this stage, you get to see the hand values of all 6 positions. The odds for each of the player positions will have changed and also the odds for the value of the winning hands. The player has the option to place bets on the player position and/or the outcome of the winning hand. This is a more informed bet as cards are now on the table. At this stage, it’s still difficult to determine what position will win or what the winning hand may be so the odds are still quite generous. The dealer then deals the 3 community cards (Flop) in the middle of the table. All of the odds are automatically adjusted and players are then invited to place their bets. The dealer then deals the Turn card. The dealer deals the River card which completes the 5 community cards on the table. The winning hand and player position are identified and the winners are paid. Where to play Live Bet on Poker? Not many of the live casinos I’ve reviewed offer this game. So far I’ve come across two live casino software providers, BetConstruct and BetGames that provide Bet On Poker. If you’re looking for a casino that offers them I can suggest Vbet Live Casino (BetConstruct), JetBull Live Casino (BetGames) and Dublinbet.